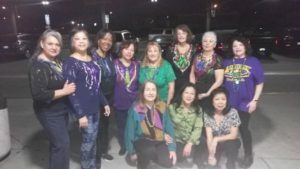 Under The Sun Line Dance – COME JOIN THE FUN!!! UNDER THE SUN!!!!! Welcome to Under the Sun Line Dance of the Inland Empire area!!! We are glad you came to visit. We teach beginners to upper level classes. We enjoy teaching seniors, adults and youths line dancing. Not only will you learn new dance steps, but will benefit from the exercise and thrill. This activity can promote cardiovascular health, mental health, improve balance, improve flexibility and increase energy levels. You will learn a variety of different rhythms such as the cha cha, mambo, waltzes, straight rhythms, country, pop and even 50’s rock and roll. The on-going Line Dance classes are offered at different levels. Come along and join the fun with the Under The Sun Line Dancers!!! No partner needed. Line dancing classes are a great place to meet with old friends and make new ones.